Dye with the Chicago White Sox. Jermaine Trevell Dye (born January 28, 1974) is a retired American Major League Baseball right fielder. Dye grew up in Northern California and was a multi-sport star at Will C. Wood High School in Vacaville. Dye attended Cosumnes River College in Sacramento, where he played as a right fielder on a team that reached the playoffs. Dye played with the Atlanta Braves (1996), Kansas City Royals (1997–2001), Oakland Athletics (2001–2004), and the Chicago White Sox (2005–2009). Dye won the World Series MVP with the White Sox in 2005. Dye batted and threw right-handed and, in his prime, was known for his ability to hit for power and his powerful throwing arm. Dye announced his retirement on March 31, 2011. He attended Will C. Wood High School in Vacaville, California and Cosumnes River College in Sacramento. He was selected by Atlanta in the 17th round of the 1993 amateur draft. Dye made his Major League debut with the Braves, hitting a home run in his first Major League at-bat. He was traded to the Royals during the 1997 offseason in a package that brought Michael Tucker and Keith Lockhart to Atlanta. He was traded to Kansas City on March 27, 1997. In 1999 Dye played in 158 games for the Royals, hitting 26 home runs. He was one of the more well-liked Royals at that time, with fans frequently chanting "Dye-no-mite" after he came up to bat. The next year he made the American League All-Star team. In 2001 Dye was traded to Oakland as part of a three-way deal in which the Royals received Neifi Pérez. Jermaine wore jersey number 24, which would later be retired for Rickey Henderson. He batted .252 while with the A's. In October 2001, during the ALDS, Dye broke his leg when he fouled a ball off of his left knee. Prior to the 2005 season, Dye was signed by the Chicago White Sox to a two-year, $10.15 million free-agent contract with an option for 2007. Dye with then-U.S. President George W. Bush. 2006 proved to be his best offensive season; he finished second in the league with 44 home runs, third in slugging at .622, fifth in runs batted in with 120, batted .315, and placed fifth in AL Most Valuable Player voting. On Mother's Day, May 14, Dye was one of more than 50 hitters who brandished a pink bat to benefit the Breast Cancer Foundation. Dye was selected to the American League All-Star Team for the second time in his career after a scorching first half in which he batted .318, struck 25 home runs and slugged .646. Dye was awarded a Silver Slugger for his offensive performance. 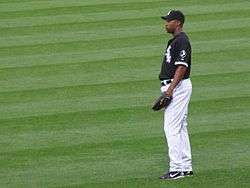 On October 30, 2006, the White Sox exercised their $6.75 million option for Dye's 2007 season. Dye, along with many other Chicago hitters, struggled in the first half of 2007, including a cold June in which he batted just .203 with one home run. He turned his game around in the second half, batting .298 and knocking out 20 doubles and 16 home runs, and finished with a batting line of .254/.317/.486. He was signed to a two-year contract extension in August. He returned to form in 2008 for the division champion White Sox, finishing second in the American League with 77 extra-base hits and batting .292 with 34 home runs overall. Dye finished second to Tampa Bay's Evan Longoria in Final Vote balloting for the last spot on the American League All-Star roster. On November 6, 2009, Dye's $12 million mutual option was bought out for $950,000, making him a free agent. On March 31, 2011, Dye announced his retirement. 1 2 Matthew Pouliot (March 31, 2011). "Unsigned Jermaine Dye opts for retirement". NBCSports.com. Retrieved July 10, 2013. ↑ "A's Dye breaks leg, out for year". The Free Lance-Star. 15 October 2001. Retrieved 26 November 2014. ↑ Ken Rosenthal (March 31, 2011). "Dye 'at peace' with decision to retire". Foxsports.com. Retrieved July 10, 2013. Wikimedia Commons has media related to Jermaine Dye.